The first anniversary of the discovery of the Gunpowder Plot. Bonfires in all parts of the country, including one on Cliffe Hill, not far from where the Martyrs Memorial now stands. 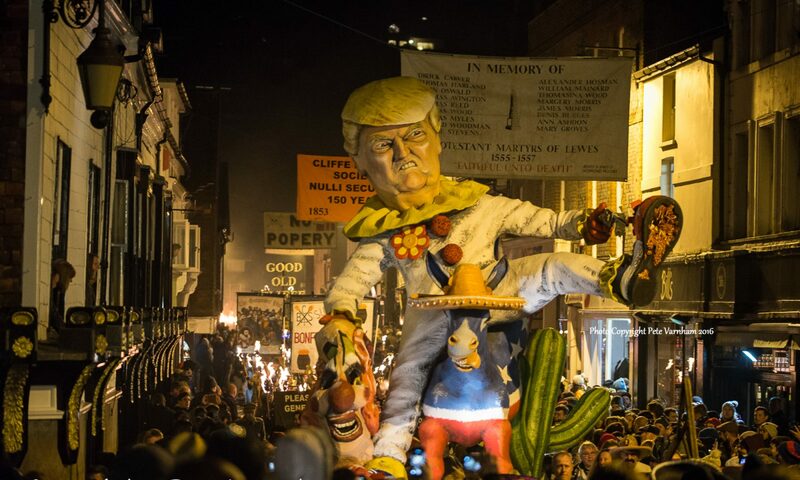 Following Titus Oates’ ‘exposure’ of a Popish plot to kill the King, anti-catholic processions similar to those held in London were seen in Lewes on November 5th. Carrying banners proclaiming the corruptions of the Roman Church, people attired in clerical regalia paraded an effigy of the Pope through the streets, finally late at night, to commit it to the flames. The dragging of lighted tar barrels through the streets was introduced. Great rioting; several arrests were made and fines up to E15 imposed. A local magistrate, the late Mr. Whitfield, JP, had a sharp encounter with the “Boys” on Cliffe Bridge (origin of the custom of throwing a blazing tar-barrel into the river). Special constables were sworn in for another attempt to stop the celebrations. The Bonfire Boys armed themselves, and Superintendent Flanigan and some of his men were roughly treated. At the following Assizes, more than twenty of the rioters were sent to prison for terms of up to two months. Bands were introduced in the Processions. The Sussex Express stated that ‘Since O’Connell and the Irish priesthood had denounced their fellow-subjects, the English as Saxon tyrants, the desire for celebrating the fifth of November in this town was increased among many of its respectable inhabitants. One hundred and seventy ‘of the principal tradesmen and other respectable inhabitants’ were summoned to be sworn in as special constables. On their way to a meeting on the night of November 4th, they were attacked by Bonfire Boys in the High Street. Tar-barrels were lighted and several incidents occurred. The police fastened a chain across the road near Keere Street and ambushed some of the ‘Boys’, who were arrested.The next day, 100 of the ‘A! Division of the Metropolitan Constabulary arrived, and great was the excitement in Lewes that evening. It was an incident involving the mail-gig from Brighton which brought things to a head. Lord Chichester read the Riot Act from the steps of the County Hall and gave the crowd five minutes in which to depart. In the free fight that ensued, many of the Metropolitan Police were injured, but the streets were eventually cleared. A committee of local tradesmen was formed, and arrangements were made to carry out the celebrations on the Wallands Fields. Pope Pius IX re-established the Roman Catholic hierarchy in England. This led the townspeople to allow the Bonfire Boys back in the streets, and two great bonfires were lighted, one in front of the County Hall and one in front of Cliffe Church. Bonfire Boys organise themselves into processions. The first societies thus formed were those of the’Cliffe’and’Town’. A feature of the demonstrations introduced by the Cliffe was the ‘Lord Bishop’who ‘officiated’. He wore full clerical uniform and gave a ‘sermon’ before the effigies were burnt. The Society was unfortunate when one of its members made off with the money box. He was commemorated the following year by being burnt in effigy along with the Pope. An epidemic of typhoid in Lewes. The postponed celebration was carried out on the night of December 31st, after a fall of snow which greatly added to the effect. A large fire in the town a month before the fifth showed the inhabitants the danger of fire, and consequently the famous Lewes Rouser firework was prohibited. Fires in the Streets and the dragging of lighted tar barrels through the streets suppressed. 130 police were on duty in the town and many people were arrested including four leading Bonfire Boys. In the ensuing court case they were acquitted of instigating the forming of a bonfire in Commercial Square. Activities suspended during World War I. The Cliffe Society resumes the Demonstrations, the only Society in the town to do so. Cliffe resign from the Bonfire Council as the only Society maintaining the tradition of burning a papal effigy. Activities suspended during World War II. Celebrations suspended owing to severe flooding in the town. The Society took an active part in the town celebrations to mark the 700th anniversary of the Battle of Lewes. Cliffe rejoins the Bonfire Council. Cliffe goes into Europe. The Society took part in celebrations in the twin town of Blois, France. The Bonfire Societies stage a Pageant of Bonfire History as part of the Festival of Lewes. The Bonfire Societies organise processions and fireworks to celebrate the Queen’s Silver Jubilee. Lewes Bonfire televised – some television coverage in most subsequent years. The Society leases some land and builds its own workshops and storage facilities. The Bonfire Societies stage a firework display for the Lewes Mayoral centenary. The Cliffe successfully applies to the Registry of Friendly Societies to become CLIFFE BONFIRE SOCIETY LIMITED. The Lewes Societies stage a firework display on the battlements of Lewes Castle to celebrate anniversary of Spanish Armada. After nearly 40 years at their Mill Road Firesite, the Society were forced to find a new site at Brooks Road, Lewes. Mr Bob Allen, a Life Member since 1969, and Secretary of the Society for 25 years, passed away in December. The Society purchased a seat in his memory for the new shopping precinct in Cliffe High Street. The Cliffe charges admission to the Firesite for the first time. The Lewes Bonfire societies and East Hoathly organise a Millennium Firework Display on 1st January. Owing to severe floods the Cliffe is forced to move its’ firesite only a week before the 5th. The Cliffe secures its future with the purchase of its own firesite.